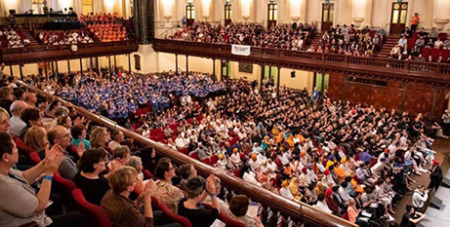 The Sydney Town Hall Housing Assembly last week saw 2500 people gather to hear state and federal politicians discuss cost-of-living issues and housing affordability. Source: Catholic Outlook. Hosted by the St Vincent de Paul Society NSW, Sydney Alliance and the Everybody’s Home campaign, the assembly called for citizens to stand for a right to home for everyone in Sydney – from those sleeping rough on the streets to the average mum and dad working but finding it hard to pay their bills in Sydney. Politicians from all sides of parliament attended, including Sydney Lord Mayor Clover Moore, Labor senator Doug Cameron, Greens senator Mehreen Faruqi, Labor members of the NSW Legislative Council Adam Searle and Penny Sharpe, Liberal Member of the NSW Legislative Council Don Harwin, Christian Democratic Party Member of the NSW Legislative Council Paul Green, NSW Greens MP Jenny Leong and NSW Independent MP Alex Greenwich. The politicians were given a set time to discuss the issue, which was followed by community leaders asking questions about their party’s commitments to social and affordable housing leading up to the state election this weekend and the federal election in May. The assembly heard personal stories from people seeking a home in Sydney, and heard from experts in the housing field, who shared the best practice to tackle the issue and the way forward. Finally, participants heard that it can be expected that the assembly will be followed up, and they were able to make a commitment to taking this issue forward and addressing it in our local communities. During a roll call of attendees, Ian Epondulan, a member of the Lourdes Young Adults Group from Our Lady of Lourdes Parish, Seven Hills, said the Diocese of Parramatta was present, representing 330,000 Catholics who have a belief in Catholic social teaching and a right for all to a home.